For applications related to evaluating Speech Enhancement devices, it is required that rooms/acoustic spaces, when this evaluation takes place, be acoustically representative for natural and often real-life conditions. This includes controlling the reverberation time, RT60. Typical small offices have RT60 values in the range of 200 milliseconds to 500 milliseconds. While RT60 is very often quoted as an average time over the frequency band of interest (typically 100Hz to 8000Hz), knowledge of RT60 in narrower bands (such as octave bands) is helpful. Usually RT60 is greater for lower frequencies (i.e., for frequencies < 350 Hz), then as frequency increases RT60 somewhat stabilizes, and finally for upper frequencies > 4000 Hz, the reverberation time tends to decay. In large spaces RT60 is much greater than in small spaces. It is not unusual to see reports of RT60 exceeding 2 seconds for music performance halls and other large rooms. Inside objects such as churches, the reverberation time may exceed 7 seconds. Controlling the reverberation time is one of the domains of interest of architectural acoustics. We limit our remarks to applications that are typical for the use of Speech Enhancement devices. The room size should be in a range between 2.5 × 3 m and 3.5 × 4 m.
The room height should be between 2.20 m and 2.50 m.
The reverberation time of the room should be less than 700 milliseconds but higher than 0.2 milliseconds for frequencies between 100 Hz and 8 kHz. For controlling RT60 for low frequencies, one can choose to use ‘sound traps’ and sound diffusers. These acoustic materials are available on the market. Sound diffusers for low frequencies are typically wooden or gypsum objects in the form of cubes, cones, wedges or irregular objects, and they are supposed to be mounted on walls and/or ceilings. Linear dimension of these objects should be chosen accordingly for the wavelength of interest. For example, for a center frequency of 125 Hz of the lower octave band, the wavelength λ = 1.4 m so objects of linear dimensions of the half wavelength (0.7 m) are suitable as sound traps for this and neighboring frequencies. By the use of the trial-and-error approach, one can substantially increase the acoustic diffusion and thus reduce the RT60 for the bandwidth of interest. For higher frequencies soft materials such as curtains covering one or two walls along with the carpet installed on the floor help absorb sound for frequencies > 1500 Hz. Also special acoustic panels in the form of polyurethane foam rectangles with one surface shape of small wedges or pyramids with linear dimension of 4 inches to 12 inches (approximately), i.e., 10 cm to 30cm, can be effectively used for the purpose of controlling RT60. Acoustic treatment of rooms for the purpose of controlling RT60 as well as for decreasing the noise floor through increasing the acoustical isolation is a trade specialty of interior design and interior architecture (a.k.a. Architectural Acoustics). VOCAL Technologies practices include characterization of acoustical environment within which the voice enhancement devices are verified and evaluated. 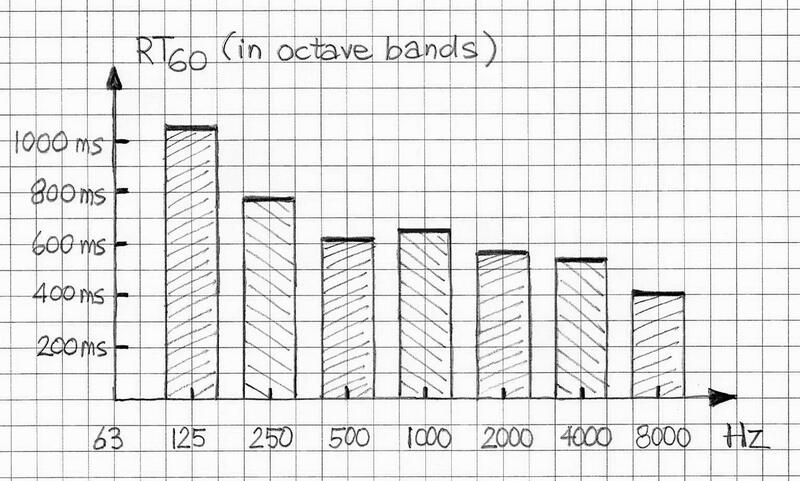 These practices include estimations of RT60 full band and in sub-bands (such as in octave bands) as well as and of critical distance parameter (Dc). In some cases numerical simulations of room characteristics are also included.